Posted by Mike Allen, President – Mobile Health Marketplace. Health insurance exchanges will be the topic of one of the 15 panels discussions at the Health Technology Forum’s upcoming annual conference on May 20th in San Francisco. The moderator of the session will be Larry Levitt, Senior VP, Kaiser Family Foundation who will lead a discussion about how the evolving mix of public and private exchanges will meet the needs of different communities. Prior to joining Kaiser, Mr. Levitt he served as a Senior Health Policy Advisor to the White House and Department of Health and Human Services and Special Assistant for Health Policy with California Insurance Commissioner John Garamendi. He holds a bachelors degree in economics from the University of California at Berkeley, and a masters degree in public policy from Harvard University’s Kennedy School of Government. For more information on the conference, visit the Health Technology Forum’s website. This is good timing considering I’m currently looking into health insurance information for seniors via http://KillianInsure.com I’d like to know of current innovations and see which plans are implementing them. 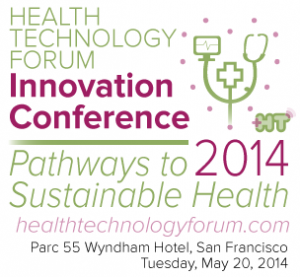 Home health technology for the underserved – expert to speak at San Francisco conference!